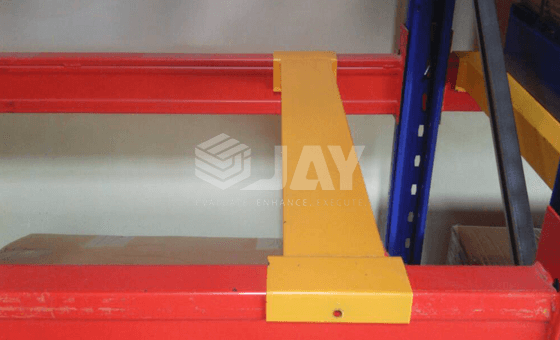 To safeguard your racking ‘Jay Storage’ produces many different types of warehouse safety products. 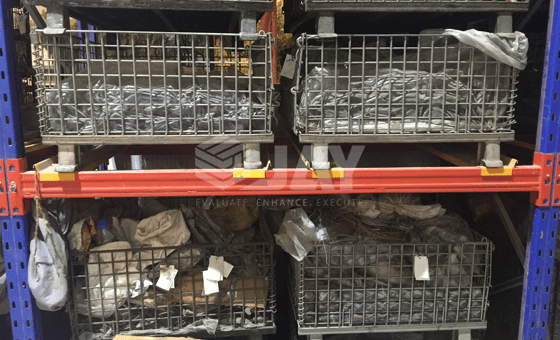 Some of them are: Upright Protectors, Upright Frame Protectors, Pallet Supports, Column Guard, Wiremesh Enclosures, Pallet Stoppers, Locking Pins, Anti collapse mesh, Safety partitions, Load Safety notice, Safety Swing Doors. Pallet Racking Upright protection can help you play an important part in the safety of your racking systems. Without it, serious damage could occur to your racking. Upright frame protection rails prevent costly rack damage that causes warehouse downtime, productivity losses and costly rack repair. 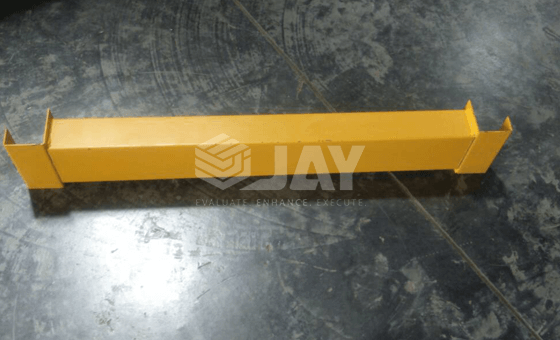 With a Bright yellow paint finish and anchored to the floor, frame protectors are highly visible and effective solution for the prevention of fork truck incurred rack damage. 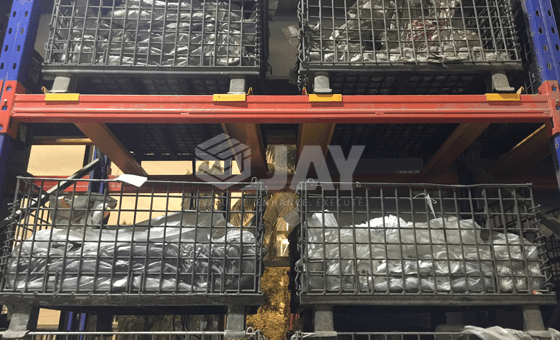 Front-to back Pallet Supports allow storage of pallets which are deep enough to fit on standard rack frame depths while providing additional support to standard pallets. Use of minimum two supports per pallet is advisable. Protect personnel from falling objects and preserve your inventory with anti collapse safety mesh that "stop the drop" before it can occur. Order pickers & lift trucks errors sometimes cause significant product damage or injuries. Eliminate it by preventing items from falling. Pallet stop beams are designed to prevent pallet loads of material from falling off the back of your rack. Pallet stops for racking are usually offset and attached to your uprights by means of an offset bracket. The offset allows for typical pallet overhang. When a pallet enters the rack it will do just far enough into the rack to set down the beams and will be stopped by the pallet load stop beam. Pallet stops are great for single rows of rack along a wall. They are also great for rack that is next to work areas. These offset beams will prevent pallet loads from crashing through a wall or landing on someone. Pallet stops for racking increase safety in your warehouse. Health & safety are very important consideration in any workplace. The load Notices are important for providing on the amount of weight that can be stacked on a particular shelf and how it should be distributed. Displaying these notices help to remain staff what they can and cannot load onto a shelf, and provides cover for the employer who has a duty to protect staff wherever that can. Health and safety is a very important part of any job, and where there are heavy loads and stacked shelves involvement in the part of this these notices are an ideal way to notify workers of details about the safe limits regarding the structures they are working with, and the loads that they can safely near.